to say it's been awhile since I've done any posting is well true but I've been diggin a few sites while warming up some goo goo muck for your ears check these fine folks out and check back in bit .. This cat is turning the people on yo! Neil Young he did sing Rust Never Sleeps he was correct! This site reminds me of The Cramps ( The Cramps RULE!). Maybe it's the weather My Weekend Starts NOW! Been getting a few notes that files are hanging or not downloading since i don't know much about this stuff I've asked an expert for a little help no call back yet (story of my life nuck,nuck ) hopefully this is one of those computer type prob's that will just sort itself out. Found some interesting stuff over the last couple of days... Found MeMag which had a link to this oldie but goodie which is part of the Acme Laboratories conspiracy, This place is good fun And thanks to The Toiler of the Sea i was hipped to this awesome Tofu Hut Music Blog post/aggregator which will keep ya busy busy for a few. If Movie Scripts are your trip then this place is your new home [cwcd] To paraphrase Cindy Adams "Only in India Kids only in India". Everyone's talking String Theory [and a few even understand it] now there is an Official String Theory Web Site. Don't know how accurate this widget is but it purports to tell ya how fast your Internet connection is. This babe's got a blog now and she hit our man Cookie off with a link proving she's got good taste. Speaking of Babe's and Blogs if only Maureen Dowd would jump in the pool (sigh). The Secret Fun Spot is always an amusing time filler. Be warned or you might get more stuff here [cwcd] Yeow this spot has grown Now with more Retro!. These have probably made the rounds already but just in case, they're a must see for any Apple/Mac freak. And a must for any Ad Freak. For the Time Wasting freak. A few for the Tech Freak One Two Three. This speach widget is nothing new to those of us who had an Amiga but a fun on line toy none the less. If you can ignore the midi file this is a good place to learn a bit about The Tao Te Ching. This Photo, one of my Favorites since it was taken by Urban Visual Archivist Matt Weber who's book The Urban Prisoner (another favorite) is one of the best New York photo books on the shelves today.The soundtrack for the book could be any of these (or other grooves of that nature) Matt's work is not so much a trip back in time no it's a journey to a forgotten (and somewhat pined for) era in our Great City. 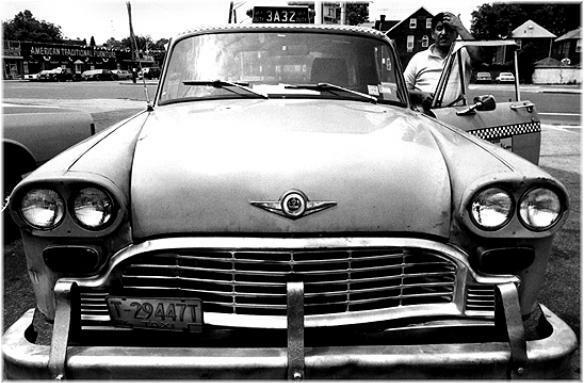 Seeing this today on Matt's site evoked So many memories of the Checker Cab, the bain of many who drove them something to do wth the exhast and the delight of parties of 4 or more 6 people could sit in the back and i think the record for us was 23 or was it 30?. For the 411 on Checker Cabs. Just got back from a wedding, Now weddings are usually good places to get really drunk and make passes at women that are normally out of ones league since I already did that on New Years Eve I just bathed in the good vibes of two young people who love each other very much , All The Best for You Katrina and Fredrik long may you reign and thanks for the party. Here's some celebratory links, a couple blogs of note For the Poop on Pop check em', enjoy the ramblings straight outta that place where Texans rest on their way to Chicago, He's Chase McInerney and we're not. This Archive of art sounds or sounds like art or something like that should give you hours of joy or at a few bits of bytes sure to annoy! and from the same portal is an archive of the infamous Aspen Magazine the magazine that came in a box with lots of artifacts an such. Been finding great stuff like this and this and if ya like the blues you will dig will. Found this at the amazing Tuning all i can say is WOW Baby! Derek and Clive kept us hurting with laughter for many a year, now Peter Cook has an Appreciation Society as well he should. I always feel a little bit smarter after a visit here and you will too. These folks are doing something interesting If you dug the Back from The Grave comps on vinyl you'll flip for this. Magnificent! the only known footage of Blues legend Leadbelly will give ya the chills, figures a blog outta London would direct me to this great New York City Rock and Roll events Photo Archive. Enough links for now cause me and Our Favorite Martian Cookie have cooked up a little sumthin' sumthin' fer ya's and i gotta git to it. Also sorry about the lame CWCD on these links if you look over to the left chances are that one of those Great sites is were I was directed to many of these fine treats Enjoy them Daily! Speaking of Parties ever wonder just what the heck is going on in your favorite Bollywood epic check here for some insight,or here for some insights of a differnt nature. A curious new blog find, some jingles and some history and this is Radio Freedom? and here's some Dutch radio ephemera and This click worthy audio archive of British Radio stuff, oh snap here's Dixe Sugar Commercials and another UK Jingle Fan site as well as air checks and Jingles from US radio, last up on the jingle jangle is this sweet spot for a load of great jingles, alright enough with the Jingles already! This might be easy listening [cwcd]for Feynman. Battle of The Bands 2004: File Under:Surf Music: Quicktime Req. Click on "This Footage is Illegal"